← Artisan Bread Made Easy with No Kneading! Angel Food Cake is a wonderful summer dessert! It is a good choice for health conscious folks, is light, and can be dressed up in a variety of ways. My kids love it so much that for years it has been the “birthday” cake of choice. In fact, when my daughter married we offered “berry trifle” made from the family recipe, in addition to the traditional wedding cake. Angel Food Cake has a long tradition in my family. My father’s mother, “Grannie” made angel food cakes frequently, as did my mother. As a child, I remember standing by and watching the process……It took me into adulthood, to risk making the cake from scratch because I feared failure. My Grandmother and Mother had set the standards very high. What I failed to realize as a youngster, was how easy the cakes are to make. All the recipe requires is a specialized cake pan, cake flour and a good mixer or a strong arm. 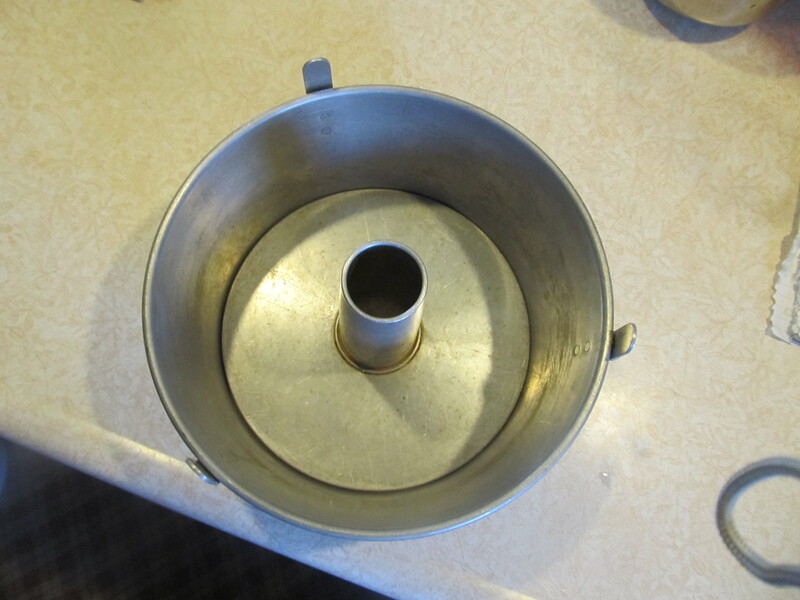 The best Angel Food Cake pan has two parts so the cake can be removed easily from the pan. The center tube and bottom are a separate piece that can be removed from the sides. This was my Mother’s pan and I treasure using it! I want you to be successful, so I will share my favorite cake recipe. It is taken from the Amish-Country Cookbook volume 1, Evangel Publishing House, Nappanee, IN (ISBN 1-928915-37-x). This series of cookbooks, by the way, is my “go-to” recipe series for nearly everything I make. My webpage is not titled Quarteramish for nothing! 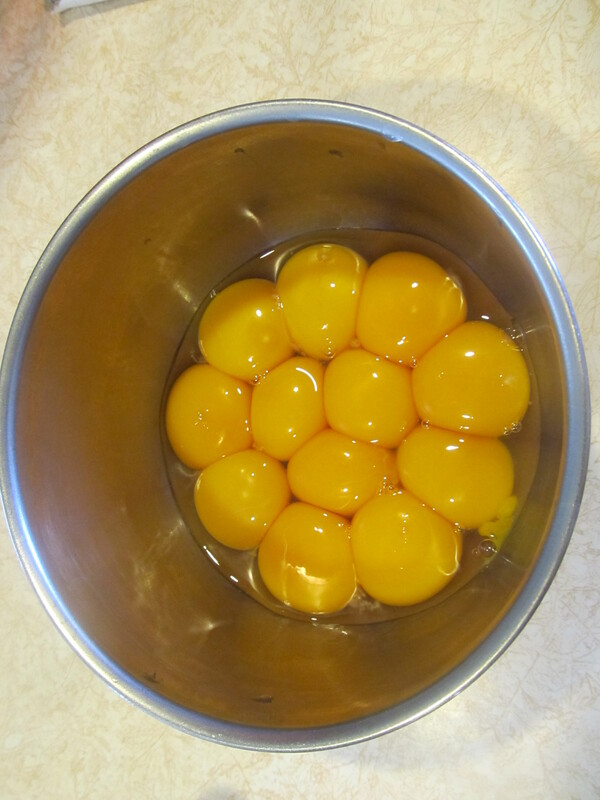 Farm fresh egg yolks have a beautiful yellow color and stand up tall. 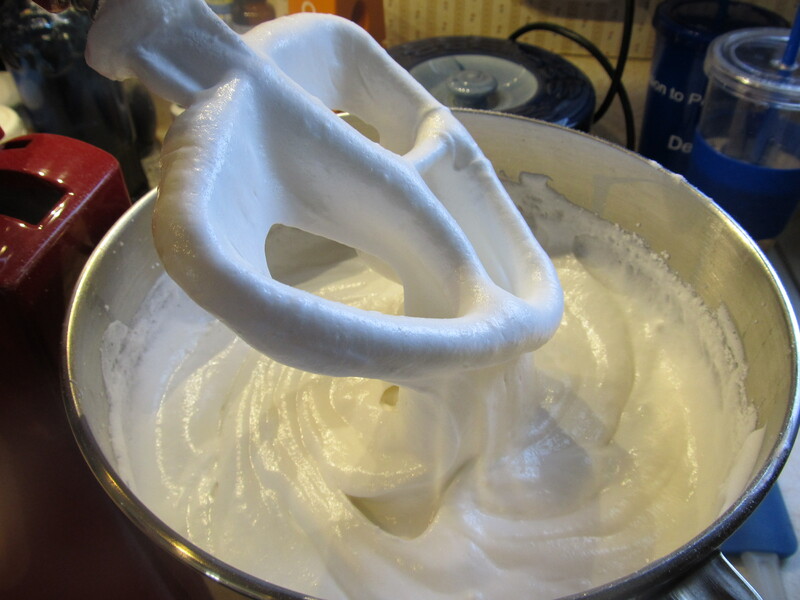 Beat the egg whites at medium high speed or high speed depending on your mixer strength. While beating add salt and cream of tartar. Beat until the egg whites are quite stiff and add 1 1/3 cups of sugar in small increments, beating until dissolved after each addition. Adding sugar gives the whites a very glossy look. When they are quite stiff and hold their shape, you are ready to proceed to the next step. Next, sift the cake flour and 1/2 c. sugar three times. 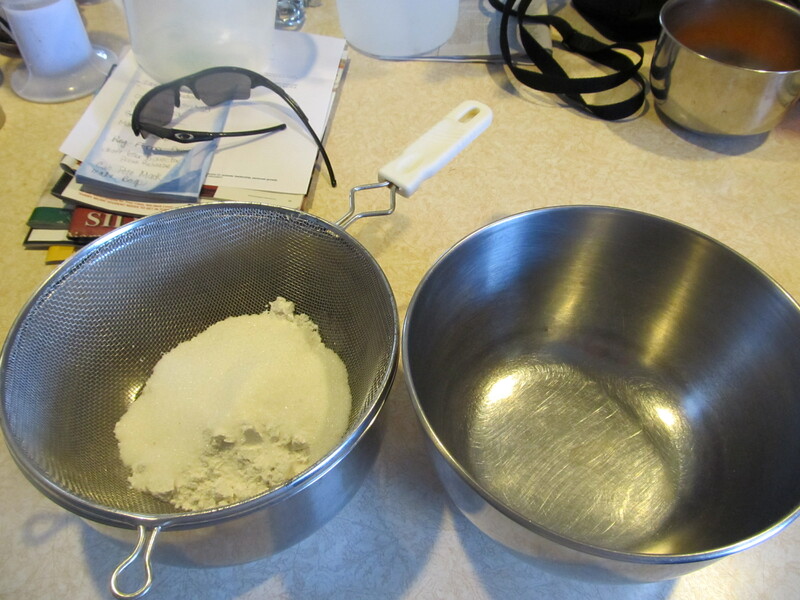 I use two bowls and a sieve to mix and refine the flour to a delicate consistency. Sift the flour and sugar from one bowl to the next 3 times. I like this method better than using a sifter. Next fold the flour mixture into the egg whites using low speed. Add approximately 1/3 of the flour each time and stir until just mixed. Do not over mix or the cake will be tough. The batter is glossy and flour is just incorporated. The batter is ready to be put into the pan. After pouring, run a knife through the batter to remove large air bubbles and gently smooth out the top before baking. After baking hang the pan upside down on a tall glass pop bottle until cool. Hanging ensures the cake will not fall during cooling. An old glass pop bottle is just the ticket to hang the cake upside down. When the cake is completely cooled, approximately one hour, turn the pan right-side up. Use a long bladed knife (bread knife works great) and cut around the inside and outside edges of the cake. 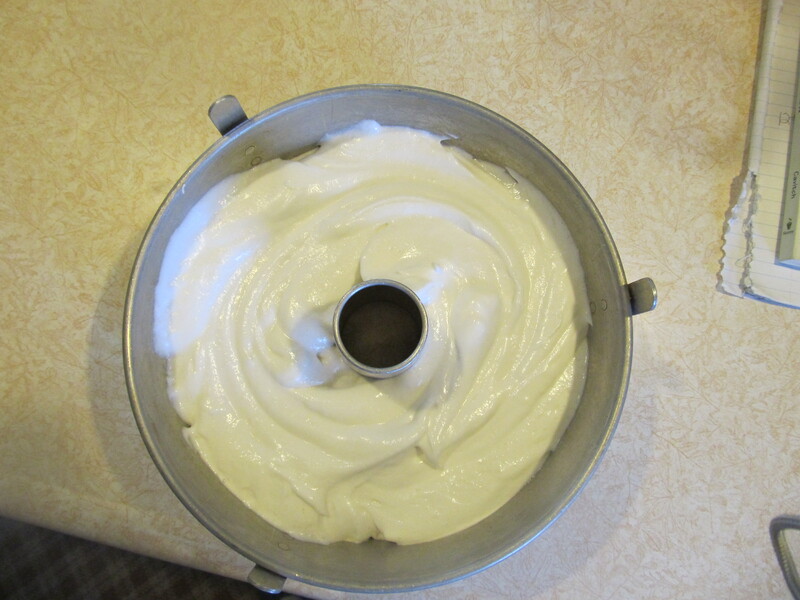 Remove the sides; then cut the cake from the bottom of the pan and remove the tube. Your cake is now ready to be plated and served. Some people remove the brown crust of the cake to reveal a pure white cake. I personally like the brown crust so I leave it on. This is a matter of personal preference. My family likes the cake served plain or with fresh fruit and a dollop of whipped cream. The entire cake could be frosted with a frosting of your choice. Remember the cake is tender and will tear easily, so if frosting the entire cake, a frosting with the consistency of whipped cream works the best. I hope this step by step guide will help you to enjoy one of Life’s Simple Pleasures soon: Angel Food Cake! 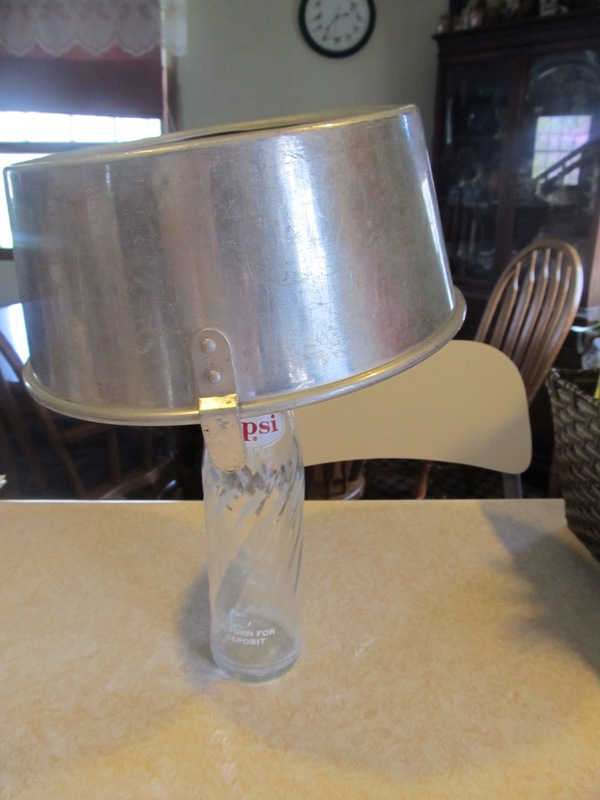 This entry was posted in DIY, Life's Simple Pleasures, Recipe, Uncategorized and tagged amish country cookbook, angel food cake, angel food cake pan, cake from scratch, dessert, farm eggs, food, home made cakes, perfect summer dessert, recipe. Bookmark the permalink.